Hope everyone is having a great Wednesday! This morning I had a meeting to discuss a very exciting project (happening mid-November) so stay tuned for updates! It’s something that, to be honest, I never imagined doing! But I’m staying open to whatever life brings me and as I mentioned in my previous post, am doing things that take me out of my comfort zone to push me further in life. Ekk! 1.) It’s Alexis; she can do no wrong. 2.) It’s not a LBD. All you have to do is throw on some heels (option to add tights) to offset the shape of the dress, grab a cute bag and voila! That’s it. Bring on the champs! Yes, I get it. The urge to accessorize over the holidays is strong. But trust me, especially in this instance, sometimes less is more. Take it from Coco Chanel, “before leaving the house, a lady should look in the mirror and remove one accessory.” You don’t want to look like you’re overdoing it. As long as your dress is quality, it will make a statement. Take a closer look at this dress. It’s a rich color. 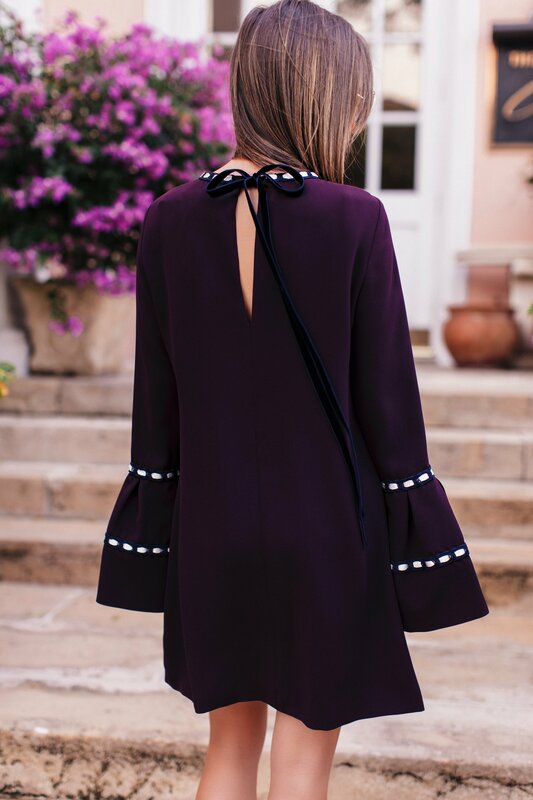 It’s trimmed with white and blue velvet at the collar and bell sleeves. It ties in the back to create an effortless drape. It’s easy. It’s chic. And great on just about any figure. To shop today’s look, scroll up to the top of this post and click the links! How pretty is this dress! So perfect for the holidays! God that is such a great color on you!!!!!!! I’m so glad you showcased the details of the dress because it is truly stunning! P.S., I’m ridiculously excited for the holidays! Wow so cute! I love that blue velvet detailing.